A small town Iowa teen has been charged with killing both his grandparents just days before a family gathering set to take place on Mother's Day. Isaiah Sweet, of Manchester, is alleged to have murdered both Janet Sweet, 62 and Richard Sweet 55, in an apparent premeditated attack on the two that initially involved drugging the couple. He reportedly had been living at their home prior to the murder. The 17-year-old is said to have called a female friend sometime on Friday and told her he drugged the two and thought they were both dead because he "couldn't find a pulse." According to a criminal complaint, Sweet then told to the female that he murdered both his grandparents. Sometime during the next morning he asked another unidentified friend for a place to stay. Sweet had earlier been arrested by police for setting off an alarm at a local convenience store. 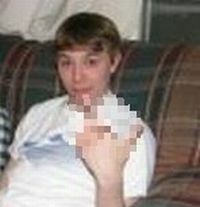 An older account over on MySpace belonging to suspect is also view able here. UPDATE: Victims died from gunshot wounds, couple took in suspect at age of four. UPDATE II: Sweet had been considering killing both grandparents with baseball bat. Update...funeral held later today for the couple. Meanwhile Sweet fantasied about killing the two with a baseball bat, according to a criminal complaint. No good deed ever went unpunished. I hope the lil psycho never gets out of jail. Bah!